With advances in technology, specifically software, we are able to lessen the tougher and boring lives of the past. Both by together or competing, tinkering and hacking away towards maximum interestingness. A bunch of startups work their ways through and around to solve different problems, unleashing and filling ever-growing desires. Many fail and a few succeed. The success of various startups each bring components toward a future that will never look the same (again and again). Recycling older paradigms, but with the right timing breaking away from the restrictions of the failed past, help build layers on layers of enablement. In many cases it becomes so obvious that many existing jobs are going to be obsolete after initial installations of technology. New jobs and industries are created after mass deployment of consensualised technologies. But startups are tough, blood, toil, tears and sweat. Blood and Toil. Maybe not so literal, but figurative. The metaphor here implies cumulatively a non-zero-sum(ness) but at individual level it is definitely (maybe) not of infinite abundance. There are both some permanence and impermanence in exchange of our blood and toil to realise ideas. Sweat and Tears. Sweating from the outside towards the inside. Anxiety meets nervousness is always washed away by the magical elixir of adrenaline rush from each win. Sometimes I cannot tell the difference between sweat and tears, is this an symptom of work becoming different? And although sweat is an unavoidable part of the progress, don’t we desire progress to minimise sweating while achieving maximum fun? Can entrepreneurship itself be broken smarter? Bit by bit, a bit more automation of tasks, a little more responsive data to form insights, a lot cheaper transactions and communication costs. Piece by piece, stream by stream, the whole eco-system should head towards becoming smarter? This is a question beyond theoretical and practical AI science, we’ll probably need experts in finance, economic, marketing etc. something from everyone while we are at this. Wins big or small in a startup can be reduced to a series of successful pattern matching. The key to success is adding up lots of pattern matched “wins”. The whole point of pattern matching, is to tinker with some purpose. An ideal purpose may seem like juggling between the concrete missions or ideological visions. Patterns we thought we have matched could be a few different types: discontinued history, trending de facto standards, and new secrets. Under so much interdependencies, these different types of patterns are akin to the Schrodinger cat. We cannot know for sure what patterns we have really matched and if a given pattern could be accurately and precisely projected into future results. So the best thing is to really take a peek inside the box as many times as possible, as frequently as possible. What make us want to know about cats? 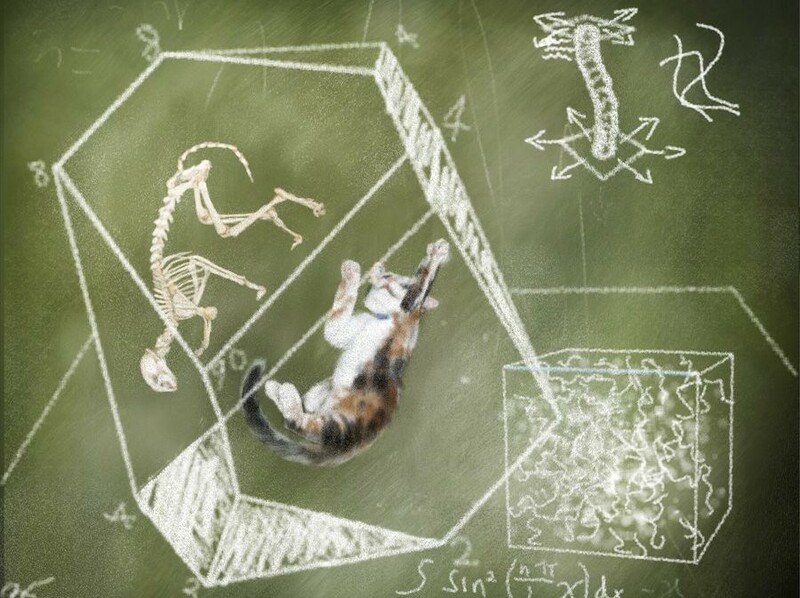 The common motivation for us to look for these Schrodingerian cats can be traced back to the two original forms of the cats: The fat cat of necessity and the cool cat of sufficiency. The fat cat is full of determination, putting head-down, getting things done type. The cool cat satiate our curiosity or for lack of a better word, cue(VGR) interestingness. Sometimes it isn’t clear that the cat is one or the other, and may seem completely different to different people. Fat cats become extinct by progress. Robots and machines, relieve us from doing necessary but tedious things. So over time, necessary tasks of the past, are aggregated and transformed by machines, each in turn decreasing the definitions of necessities required in the future. Not looking back with perspectives often have us taking tech enablement for granted. Cool cats on the other hand evolve. The more technology have enabled us, (building both the supply-side foundations and demand-side expectations), the more we want. Sufficiency of the past increases and raises the bar of what is sufficient of the future. The challenges with pattern matching, is first getting the data. And then matching it with regularities we hypothesise. Although data is all around us, valuable data are often actively gathered, sometimes foraged to a point where the bias confuses you just enough to keep you going and think bigger. There is a big difference between individual cognition of beauty and interesting(ness), to patterns becoming diffusible and deployable. The difference lies in the common denominated recognised patterns of other individuals in relations to other components in the system, i.e. getting consensus. When you are part of the pattern itself, contributing, reacting, anticipating, you may just control the path-dependent journey a little better. Different paths are IMO forged by the actions and reactions at each intersection. The different forces are influenced by both the external market factors and internal drive of a company. With so much action and data happening on different parts of operation and on different levels, our pattern matching is often paralysed into states of confusion. All organisations (have to) limit their perception, cognition and functional capabilities, to focus on key performance metrics: profit, revenue, margins, growth etc., negating irrelevant signals such that “eye on the prize”, “assembly line efficiency” is achieved. I believe, it is this organisational latent inhibition that give arise to the Innovator’s Dilemma. Instead of looking at a current vs future dichotomy, where objectives have a lot more mobility, look at the structure and processes: executional components that are optimised for every organisation affect the mobility of innovation even greater. Well-oiled machines often function with advantages in noise-reduction and compression of key signals. Resulting in pumping out the desired results. Startups with less aggregated experience and not-yet optimised structures and hierarchies are like babies. We have magnitudes less of (already-)trained patterns to inhibit assumed irrelevance. Yet the desire to want to absorb, process all the information is higher. This is because the rate of encountering new patterns is probabilistic much higher for younger companies, everything is little more interesting to us. As part of evolution, the analogies from organisation to humans are similar. We mature through increased latent inhibition capabilities. Individuals with low latent inhibition, (often?) lead to schizophrenia. Though studies have shown, individuals who have capability to cope with low latent inhibition, i.e. they are able to process magnitudes higher sensitivity than the average person. They can see, feel, sense data with more modality and with higher frequency. If we use very loosely network value theory (any one of them…), the aggregated and processed value of data grows greater than linearly. This is where genius happens, together. Bigger data, store, compute, networked. Today we are lucky to be able to work with infinite bandwidth, abundance computing power, every imaginable way to interface with machine, people and ourself. Is wanting to achieve organisational, market, product mindfulness not pragmatic? But then software eats zen too, I think. Tinkering aimlessly is many times fruitless, and almost always exihbiting a sense of idleness if results are immediately evaluated after. Is there a way to pragmatically idle towards something amazing, accumulated, and progressive? Can tinkering be choreographed like a ballet or is it more the like euphoric movements at a rave? Structure, to control and be controlled. It is all too natural to fall into the fallacy of control. Networks vs Hierarchies, may be an idealised dichotomy, where theoretically the two poles are clear with conceptual and semantics differences, but in practise this line is blurry and with exponential rate of innovation, the networks vs hierarchies distinction feels blended. Choreographed tinkering lead to incremental improvements at best, and create systems that collapse in the non-idealised case scenario, viz. the arrogance of explicit rational assumptions on heterogeneous interdependent agents. If we offer a little more emapthy to all the different responses, be more aware, build interconnected feedback loops… Maybe mindful tinkering, defined as interestingness-driven actions to fulfil more interestingness, by both interesting, less interesting, and non-interesting patterns to achieve it. 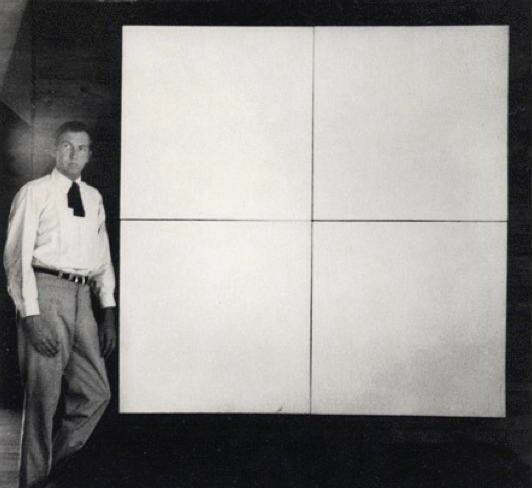 Robert Rauschenberg, White Painting, 1951. House paint on canvas, 72 x 72 in, four panels. Collection the artist’s estate. … very much like the way internet has progressed. Syntax, in maths refers to the rules governing the behaviour of mathematical systems. In software, we instruct machines in code, conversations of machines are also coded. There are a lot of machines, and there are going to loads more. Syntax, in linguistics are set of rules, principles, and processes that governs the structure of sentences in language. There can be no consensus without common syntax. What are the syntactical governance in an organisation that differentiates and adds competitive edges? And do we develop our own intra-organisation syntax through mindful tinkering (of our language and our systems)? Organisations like both human and machines are limited by the syntaxes they are capable to compile. Syntax provide the form and imply processes. Bringing the structures into life are the symbols and their semantics. The richness and precision in our languages and logic are polished and refined by semantics. Symbols and semantics are essentially consensually recognised patterns of data in a networked world. There is a fuzziness in symbols and semantics since real world patterns are of infinite convoluted true/false/positive/negative dimensions. Some individuals or organisations sort through this fuzziness better than others. Structures should be pragmatic like compilers instead of commendments. The structures should be efficient but welcomes and accepts patterns that are not quite-yet recognised (which might decrease locally optimised efficiencies). When the structures are becoming more agile while at the same time being more interconnected, we are enabling more interaction and aggregation points to gather, debate and test rough consensus. … driving more awesomeness into the world. Are we heading into a world where the line of individual interestingness and aggregated productivity (fun)ctional interestingness are blurred? Is trust better structured, based on aligned selfishness*? And consensus propagated roughly (enough) more? *Self-interests: more of interestingness, less like the Econ 101 interest-rate one.